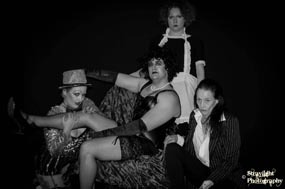 The Magic City Misfits, based out of Minot, North Dakota, was formed in late 2014 after founder and co-director James Falcon began to suffer from RHPS withdrawals. Falcon, who performed with Sins of the Flesh (Allentown, PA) and later Sweet Translucent Dreams (Bethlehem, PA), periodically performed with the latter cast when he was in town, which was about once a year at most. "That was not enough," Falcon said, noting that when he first began performing in RHPS shadow casts in 2002, he was doing it every Friday and Saturday night. "Doing a show once a year - and that was if I was in town for the show - wasn't enough." The idea for a North Dakota cast -- the only regular shadow cast in the surrounding region (Minneapolis, an eight-hour drive, is the next closest) - began to brew in his mind. "The local college did a show here for Halloween - not with a shadowcast, it was just a screening - in 2014 and it was pretty popular, so that motivated me to get things rolling," he said. After putting out feelers on Facebook, he developed a cast of friends, strangers who became friends, and strange friends. They took to the stage for the first time (to a sold-out theatre) in July 2015, and since then, the Misfits have performed five shows (about three a year) with an upcoming Halloween show to close out the year. In 2017, the Misfits hope to expand their breadth, such as traveling to other cities in North Dakota to do RHPS shadowcast performances; staging shadowcast performances of other movies; in addition to putting on original productions. "We have a lot of dedicated cast members who throw themselves into the show, and that is awesome. The audience loves it, too. They go hand-in-hand to make each show spectacular," Falcon said. "I think Minot - and North Dakota, as a whole - is ready for what the Misfits has to offer."